A couple of weeks ago I shared my basil pesto recipe I got to thinking about what else I could use the pesto in, and turkey meatballs seemed like the perfect answer. I love turkey meatballs, my mom makes makes them all the time and they’re an easy way to add healthy protein to your day. The addition of pesto adds some nice salt, Parmesan and nutty taste which compliments the meatballs nicely. I also started using panko breadcrumbs with Italian seasonings which keeps these meatballs from getting too dense. 3/4 cup panko breadcrumbs with Italian seasoning (if you can’t find these breadcrumbs with the seasoning, add a teaspoon of dry Italian parsley and a teaspoon of oregano). 1. Preheat oven to 400 degrees Fahrenheit. Warm a large pan over medium heat, add enough olive oil to cover the bottom of the pan. 2. Mix all ingredients in a large mixing bowl. Gotta say, hands might be the best mixing tool here, but be sure to wash up well! 3. 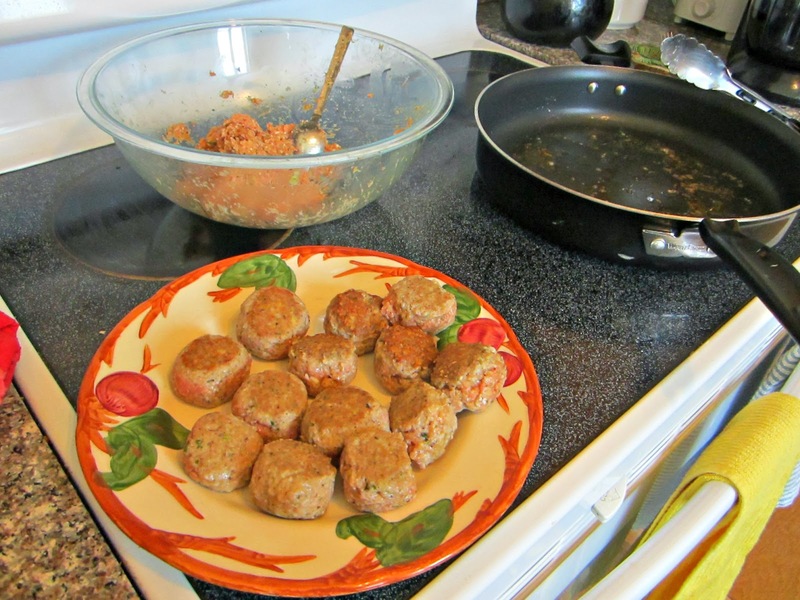 Gently roll tablespoons of the turkey mixture into meatballs. Wetting your hands before rolling the meatballs will keep them from sticking to you. Don’t worry about making these perfect, you don’t want to overwork the turkey or you will end up with hard meatballs. 4. Sear outside of meatballs in our preheated pan, do not cook through. 5. 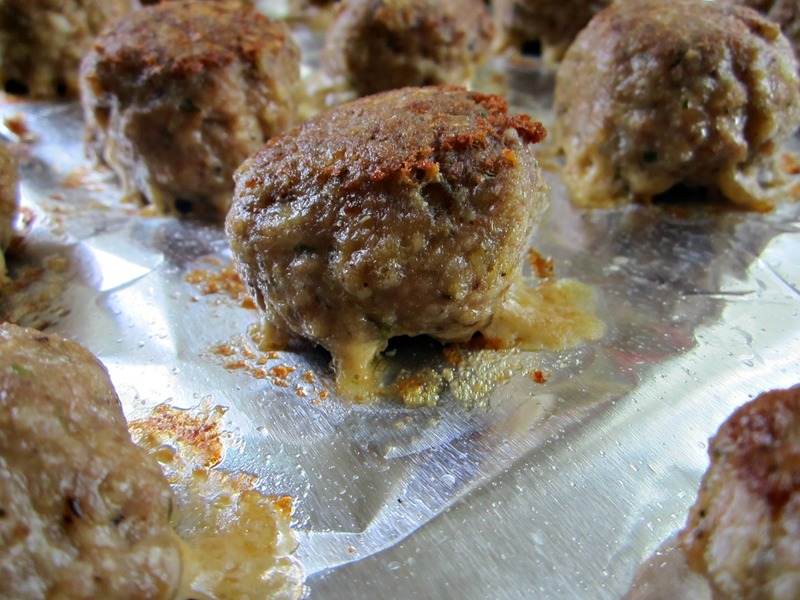 Place meatballs on a foil-covered baking sheet and bake for about 10 minutes at 400 degrees. Be sure to cut into one to make sure they are cooked through (aka no pink squish bits in the middle). These meatballs stick a little bit to the foil as the cheese inside melts, so removing them from the foil sooner rather than later is a good idea. Enjoy! !